Access: Provincial Road no. 2 "of Valle del Mis" in the stretch between Titele and Gena Bassa (at 2.5 km from it); car park. Environmental context – Description of the site: Valle del Mis marks the border between Alpi Feltrine and Monti del Sole mountain group and represents a privileged tourist access for the protected area. The road gives easy access to the Park central area and gives the opportunity to visit places not only of rare beauty and naturalistic interest, but also of considerable historical and human interest. In the past, Valle del Mis was characterized by several valley bottom settlements and some nuclei on the sunny slopes; today, instead, it is characterized by a rare and increasingly weaker human presence. The stretch of valley within the Park area was devastated by the creation of a dam (1957-1962) that "canceled" the tillable land, the valley bottom rural settlements, and the old road. Moreover, it was tragically affected by the tragic event of the 1966 flood. The latter, which caused serious damages and isolated the upper section of Canal del Mis for decades, accelerated the ongoing process of abandonment, and in 1972 the valley was entirely abandoned. Situated in the final stretch of Canàl del Mis, before the greatest narrowing of the valley which opens then again in the north, on the woody slopes of Gosaldo, the little village of La Stua (482m asl) is situated in the point where Rui Bianch flows into Torrent Mis, marking the administrative border between the Municipalities of Sospirolo and Gosaldo. 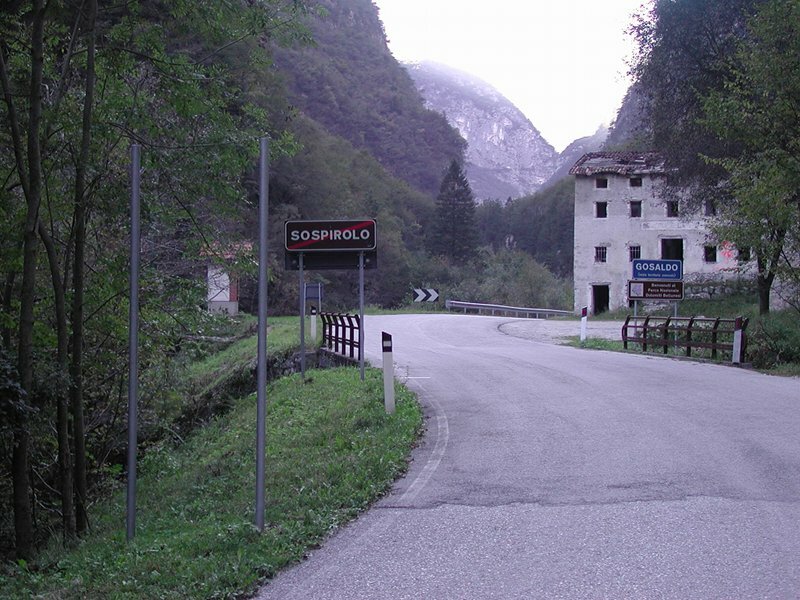 Situated at about 11 km from Sospirolo, it lies within the administrative borders of the Municipality of Gosaldo and within the Park. Architectural features: small village born as residential area and transformed then into road "equipment" for those people who went along Canal del Mis (former tavern/inn, houses, factory). Great historical-testimonial value. The complex of La Stua, abandoned after the 1966 flood, was situated along the ancient road of the Mis and was formed by a Tavern, two houses, and a small factory with a few annexed minor buildings. The various buildings are organized according to a wise plan (in order to exploit the best possible exposure to receive the light of the sun that, especially during the long winter, is rather difficult to see here) and connected one with the other by a characteristic system of paths and stairs continuing towards the terrace behind the village, once exploited for the hoed crops and as meadow, and towards the buildings forming the mill. The former tavern is a four-story building in stone and wood with bent-tile roof which has maintained intact its original features, but which has fallen into a serious state of decay. Originally a house with annexed stable and storehouse in the early 20th century, it was transformed into a Tavern and a hospice in the first post-war period, after the creation of the northern stretch of the road (1919); this favored the transit in the Mis bottom valley, in the stretch upstream La Stua, accessible only on foot up to that moment, and, as a consequence, justified the presence of a rest area. The other buildings were transformed into houses. The factory of La Stua is a small building used in the past as sawmill, cereal mill, garage, and blacksmith's shop. It consisted of a two-story central brickwork building (still present) with a wooden roof, and it used to house the various machines driven by a turbine; the latter, set in motion by water, was situated in a small wooden structure leaning against the eastern wall (no longer present). The pressure water pipe, the artificial banks of the millcourse, and the millcourse itself, as well as the bottom outlet and part of the inlet are still visible, while the factory is a ruin. Buildings used to provide accommodation (tavern/inn), houses, and proto-industrial structures; abandoned since 1966, in poor conservation conditions. The small factories, very widespread in the past also in the areas crossed by minor torrents, are today very rare; as a matter of fact, La Stua complex is the last that can be found within the Park. It seems almost impossible today that the small building could house so many activities. The latter are documented not only by the increasingly weaker traces we can find on the spot, but also by a report presented to the Office of Works in 1935, which gives us the opportunity to learn a series of interesting facts on the factory. The inlet works on the Rui Bianch were not that strong: "some pebbles, some gravel and sand, adequately arranged, well suited the aim". The channel is entirely dug in the ground and is equipped with an elementary spillway and corresponding coated outlet channel. The factory was organized on two floors housing the various machines (including a "Venetian" saw). The machines were driven, through countershafts with pulleys and belts, by the turbine Pelton placed under the waterfall in a small annexed structure leaning against the mill. Moreover, there was a small dynamo supplying the electric energy for the lighting of the buildings. In 1964 only the dynamo was still working, while the machines were no longer used. We cannot talk about industrial use, but rather about a complex of clever devices meeting the needs of the local people who, living far from the towns and exploiting the only available resource, tried to create "the most useful possible comforts (...)". The place has become a lap of an itinerary dedicated to water that will be created in the future; developing along the road going from Val del Mis to Titele, this itinerary will give the opportunity to deal with the past and present uses of water and with its naturalistic values. Near La Stua village, on the opposite bank of Rui Bianch, there is a picnic area where you can stop if you want to visit the place.